[Hot News] New software update for E71 available! It seems we have one more update available for E71! Please check Nokia Software Update page to if newest software version (200.21.118) is already available for your E71 product code! OK I’ve got mine phone finally updated, but I thought it is a good idea to write – how to make software update as least harmful for the user as possible? What do I need to do before changing software? Please keep in mind to have a battery fully charged. I really mean it! Yesterday Nokia Software Update tool was trying to download the update at least several times before it was successful. Why? Most probably servers were busy and transfer has been interrupted several times. All this time your phone is connected to your PC using USB cable in PC Suite mode. Remember that the phone’s battery is not recharging at this time. Make your personal data safe! Do you synchronize your phone with your Outlook, or other PIM applications via PC Suite? Yes? That’s good, but it’s NOT enough! Using PC Suite create a full backup copy before starting upgrading process. What about files and applications installed in your phone memory? The BEST, FASTEST and EASIEST way of saving your personal data is making a copy of your phone memory on a memory card. Please make by choosing: Tools > Memory > Options > Back up Phone Memory and wait until it will be competed. The final step is making your memory card safe as well. If you use any ciphering or coding tools please remove passwords and switch it off, because in other way after update the card might be inaccessible. To be sure about the card I simply removed it from the phone before running NSU tool. Please take care about a computer using for software update as well. Use only build-in USB ports, instead of those in docking stations or hubs. If you are using laptop make use it’s battery is fully enough to support whole process. Be aware of stability of your system too! It is wise to close all applications which could make system crash during updating your phone. How to behave during the process? Be patient and don’t panic! As NSU suggests do not interrupt the process by disconnecting phone from your computer or closing application. As I said it might happen that the NSU downloading process will be interrupted. Simply please try again. It is no longer my phone! Right, after successful update process your phone will be as new as taken out of the box. No contacts, photos, or applications. The fastest way to restore it is to use memory card with a copy done before. Use path: Tools > Memory > Options > Restore from card. Few minutes and it is done! Most of your information and applications installed in phone memory should be back. It may happen that some of them disappear or won’t be running properly. Just reinstall those apps, some of them might ask for serial number again. What if something went wrong? It just happens, so please do not panic, don’t blame yourself and contact your local Nokia Care Center for assistance. Ok, it’s late, but finally I managed to download software update and my E71 is fine with new software. Now it’s time for observation. Hear you soon! 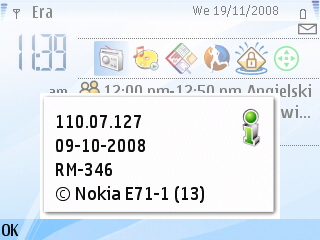 Nokia E71 software update is here! 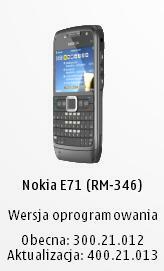 The NSU page finally shows a software update available for my E71 country code (Poland). I hope soon I will be able to share here my very first experience of a new software version. Check your codes in the meantime!